Successfully Added FPV Goggles - 68 Inch Virtual Display, 3D Support, AV In, Wireless Connectivity, 200m Range, 960mAh to your Shopping Cart. Widen your view of the world with these magnificent FPV goggles. Supporting AV in these video glasses can be easily paired with your TV, DVD player, and game consoles such as your x-box or Play Station – bringing your media experience entire new heights. Additionally, these video goggles can be connected with drone and action cameras through its wireless connectivity – giving you the possibility to view the world from an angle as never experienced before. Simply sync these FPV glasses with your drone camera and you’ll be ready for take-off. With its superb video quality and big screen simulation, these video goggles make you feel as if you were personally flying through the sky. From how on your drone will never get lost out of sight again as with these glasses you’ll be able to see anything your drone is seeing. So sit back, relax, and get ready for take-off – with these FPV goggles you are ready to conquer the skies and experience the world from an entirely new perspective. During those less adventurous days you spent in the comfort of your own home these video glasses allow you to pair them with your DVD player, TV-box, and even game consoles – providing you with a first hand and excellent media experience. With its built-in high-quality earbuds, these video goggles further enhance your media experience as from now on you no longer get distracted by neither outside noise nor movement while enjoying your favorite media and games. When paired with your TV- or X-box these video goggles allow you to undergo a realistic gaming experience and cinematic media experience at any time of the day. 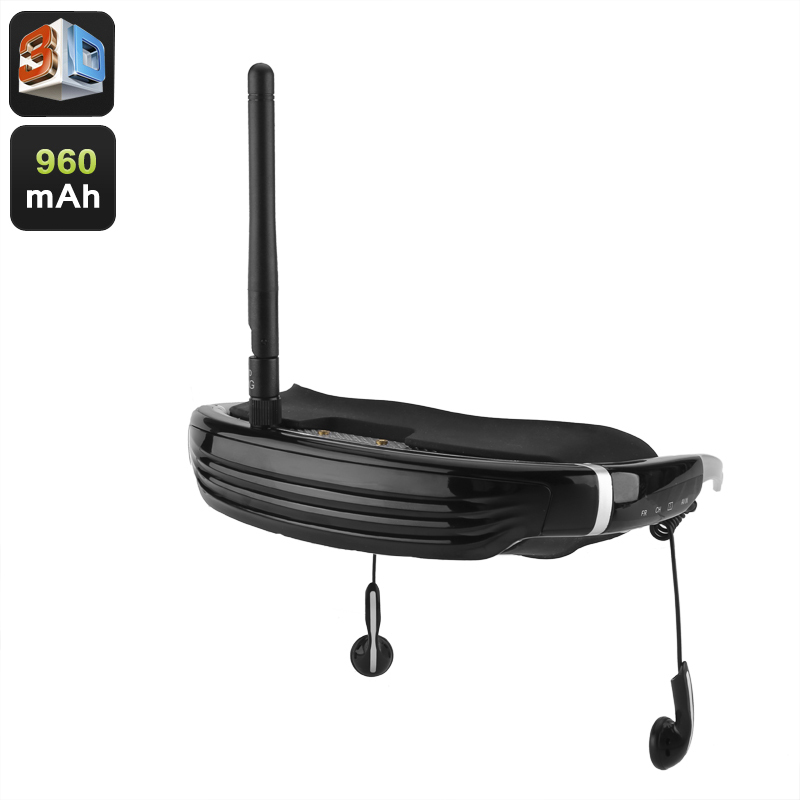 With its 960mAh battery, these FPV-glasses allow you to enjoy your favorite media and 3D games, or to head out on your next airborne drone adventure, for three hours continuously. With its adjustable luminance and contrast, you can be assured that you will always have a clear and sharp image – guaranteeing great detail and vivid colors. With its comfortable design these TV glasses offer a comfortable fit no matter the shape or size of your head – so sit back and relax while enjoying your favorite media or live video footage on these magnificent big-screen video goggles. These FPV glasses come with a 12 months warranty, brought to you by the leader in electronic devices as well as wholesale electronic gadgets..